HubPages strives to be the best place to write on the web. We have a fantastic community of Hubbers who regularly write content about almost every topic under the sun. So we like to think that HubPages is already a great place to be if you are a writer. We want to make HubPages a great place for readers, too. There are so many interesting Hubs, comments, and forum posts created every minute of every day on HubPages, that whether you are a writer or not, we think it’s worthwhile to keep up with the latest goings-on. The trouble is that the interesting stuff is scattered all over the site, so it’s easy to miss some of the content that you care about. HubPages recognized this problem early on and created Hubtivity as an initial attempt at a solution. Hubtivity, while popular, had some limitations, though. In particular, it wasn’t very customizable. Larry recognized this shortcoming a few months ago and came to the rescue with the amazing new customizable home page. With the new home page, you can keep track of the exact topics and Hubbers you are most interested in. Thus, the problem of customizability was solved! But there was another problem with Hubtivity, namely the lack of interactivity. If you wanted to read a Hub, leave a comment, answer a question, or anything else, you had to leave Hubtivity and go to another part of the site to do what you wanted to do. In our attempts to rectify the situation, the new HubFeed was born. Besides interactivity, there are a couple of key differences between the HubFeed and Hubtivity. For one thing, Hubtivity shows you everything that happens on the site that is relevant to you, whereas the HubFeed takes a more selective approach and tries to show you only the most interesting stories. You can help the HubFeed decide which stories to show you by (1) following topics that interest you and (2) hiding Hubbers and topics that don’t interest you. To hide someone or something, mouse over the gray circle with the X on it that appears in the top right corner of a story. Another new feature of the HubFeed is the ability to post status updates. You can write any message you like that is 140 characters or fewer. Your followers may see your updates in their feeds. If you see a story in your HubFeed that you particularly like, you can express your approval in one of two ways. You can “like” the story, so that others who see the same story in their feeds will know that you liked it. Or you can “share” the story, which will push the story into the feeds of your followers. You can also “star” the story so that you can easily access it later. Just like you could with Hubtivity, you can configure your feed so that it only includes certain types of stories by editing your “filters by type” in the sidebar. We hope that the HubFeed will make it faster and easier than ever to find and contribute to the conversations that you most want to be involved with. Beyond that, we hope that it helps you to discover great content that you might otherwise have missed. I for one wouldn’t have seen pgrundy‘s hilarious new Hub Top Ten Passive-Aggressive Gifts for People You Hate if it hadn’t been for my HubFeed. On a whim, I decided to follow the topic “Holidays & Celebrations.” As a result, pgrundy’s gifts Hub appeared in my HubFeed. I saw Nelle Hoxie‘s comment about how she laughed so hard that she was in tears when she read pgrundy’s Hub, so I had to find out what was so funny. After I read the Hub, I liked it so much that I read a couple more of pgrundy’s hubs, and then decided to become her follower. I suspect that pgrundy is just the first of many talented authors I will discover using my HubFeed. The current HubFeed is just a first incarnation, and we will definitely be making improvements to it in the near future. If you have ideas, as always, you can let us know by commenting or posting in the forums. ← The Payout Chronicles: Nelle Hoxie makes $1000 in a month! 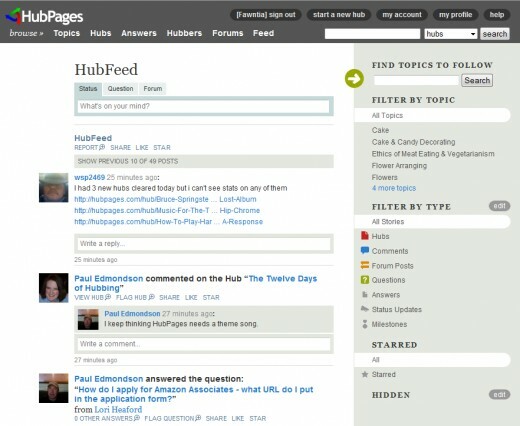 Wonder if there could be a critic section in hubpages like squidoo. This could help improve hubbers quality by exchanging worldwide views and learning from experience. I’m not sure if I like it but maybe its not for me. I’ll stick to making hubs. This is fantastic addition to the site. Sounds like a nice new feature! Thanks! Loaded with the best information, thank you.